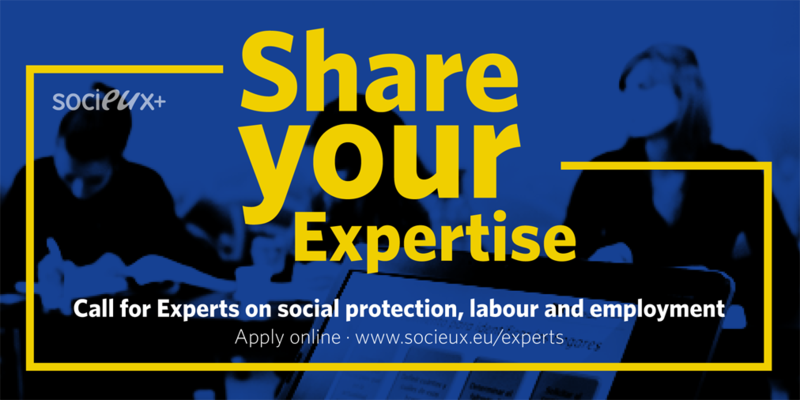 SOCIEUX+ EU Expertise on Social Protection, Labour and Employment is a technical assistance facility conceived to support partner countries and institutions to better design and manage inclusive, effective, and sustainable employment policies and social protection systems. SOCIEUX+ provides access to short-term high-quality European expertise from peers to peers. Knowledge Development activities to capitalise the results of actions carried out in the framework of the Facility. Its synergetic, peer-to-peer approach ensures a tailored, to-the-point, technical cooperation. SOCIEUX+ actions take the form of single or several short-term activities which are in general implemented onsite. SOCIEUX+ partners with public authorities and mandated bodies at national, regional and local levels working in the in the fields of social protection, labour and employment. A flexible, demand-driven instrument, SOCIEUX+ invites partner institutions to submit requests for technical assistance. The high-level meeting was backed up by the highest-level of institutional representation including Commissioner Neven Mimica, Deputy Director-General Klaus Rudischhauser and Belgian ministers of Social Affairs Maggie De Block and Development Cooperation Alexander De Croo. The conference was attended by more than 250 experts amongst decision-makers, official representatives and practitioners of the EU Member States and Partner Countries. The new European Consensus on Development confirms the EU’s solid commitment to promote inclusive social protection systems and employment policies as means to reduce poverty, vulnerability and inequalities in partner countries. SOCIEUX+ is set up precisely to improve the capacities of partner countries to design and manage inclusive, effective and suitable labor and employment policies and social protection systems. SOCIEUX+ builds on the experience of SOCIEUX EU Expertise in Social Protection, which provided over 1,700 days of expertise in 37 actions in 23 different countries worldwide over a three-year period. Please download SOCIEUX's 2013-2016 Report for more information. SOCIEUX+ is a demand-driven technical assistance facility where institutions from partner countries submit requests in a simple format. The SOCIEUX+ Team then fine-tunes the request in collaboration with the requesting Partner Institution to ensure a tailored and well-defined technical cooperation. Furthermore, SOCIEUX+ includes Knowledge Development activities to capitalise on the results of carried out actions. SOCIEUX+ is uncomplicated, quick, and flexible. Its peer-to-peer approach guarantees appropriate and adequate technical cooperation that builds on a common understanding of issues at hand. employment policy, security and services, vocational education and training, and skills development. SOCIEUX+ has the financial support of EuropeAid and is implemented by an EU-wide Partnership: Expertise France (leading member), the Spanish Fundación Internacional y para Iberoamérica de Administración y Políticas Públicas (FIIAPP), Belgian International Cooperation on Social Protection (BELINCOSOC) and the Belgian Development Agency (Enabel). SOCIEUX+ welcomes experts and their home institutions’ to join us in our effort to strengthen institutional capacities and policies in social protection, employment and labour. We aim at mobilising expertise from and promoting collaboration with public administrations and mandated bodies of EU Member States. In the framework of our triangular cooperation actions, we also seek collaboration with institutions of EU Partner Countries to spread regional best practices and expertise. The experts mobilised by SOCIEUX+ are given the opportunity to acquire valuable experience and personal development by working on all steps of our technical assistance actions from the preparation of missions, the interaction with partner institutions, the delivery of outputs and follow-up of activities’ results. 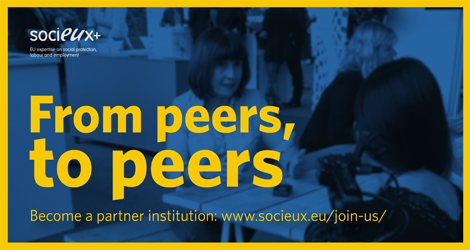 EU Member States public administrations or mandated bodies may join our efforts to support our partners by becoming collaborative institutions of SOCIEUX+. SOCIEUX+ encourages requests for technical assistance from public authorities, mandated bodies and social partners at national, regional and local level in partner countries. International organisations can also support partner institutions in requesting technical assistance from SOCIEUX+, and collaborate in the implementation of actions. Latin America, Asia and the Middle East. Africa, the Caribbean and the Pacific. How to access SOCIEUX+ technical assistance? Download and fill in the Request Form. Attach relevant supporting documents and information. Send it by mail or email. For partner institutions submitting requests with the support of international organisations, the contact details of the organisation and its potential contributions to the implementation of the requested support is important for the consideration of SOCIEUX+ response.